Brian Edwards, director of Northwestern’s MENA program, addresses the audience of about 95 at the Evanston Public Library on Monday. MENA faculty members Edwards, Wendy Pearlman, Henri Lauziere and Jessica Winegar discussed four misconceptions about the Middle East. 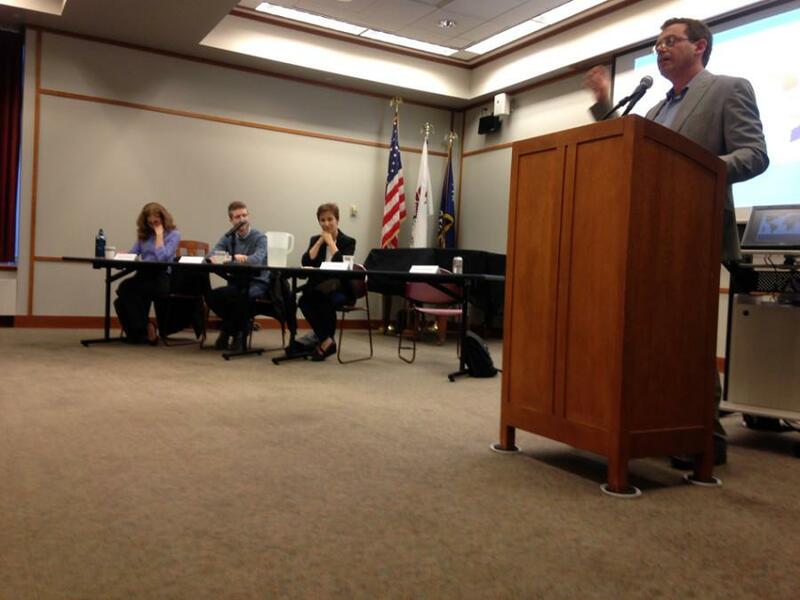 Northwestern professors Monday discussed misconceptions about the Middle East and the reasoning behind the myths. Held at the Evanston Public Library, 1703 Orrington Ave., the event was the third lecture in an ongoing partnership established in January between the library and NU’s Middle East and North African Studies Program. English Prof. Brian Edwards, director of the MENA program, spoke first about the misconception that people in the Middle East hate America. Edwards showed the crowd of around 95 people the October 2001 Newsweek magazine cover titled “Why They Hate Us” with a picture of a Pakistani boy holding a gun. He said the cover represents the problem of defining Middle Easterners and North Africans as a single group, because many different cultures and peoples live in the region. Edwards said as a result of the cover many people believed a history of Middle Eastern conflict led to “rage” against the West. However, Edwards said portraying the Middle East this way is inaccurate and pointed to examples of Middle Eastern people accepting Western culture, such as Western music and art. Anthropology Prof. Jessica Winegar talked about the myth that all Middle Eastern and North African men oppress women. Winegar said it is untrue to generalize that all men in the Middle East oppress women. Some injustice, though, does occur, Winegar said, and Middle Eastern women’s rights are not always respected. “The mere existence of rights doesn’t mean that they will necessarily be applied,” Winegar said. Winegar highlighted the fact that women are underrepresented in government and are subject to wage inequalities in not only the Middle East, but also in the United States. “What’s important to remember is that these legal systems are products of state apparatus, not necessarily of men,” Winegar said. History Prof. Henri Lauziere presented the misconception that Islam is a political ideology and not a religion. Lauziere said the idea of Islam as a political ideology goes against the teachings of the religion. Political science and Middle East studies Prof. Wendy Pearlman tried to dispel the idea that violence in the region results from longstanding grudges between groups of Middle Eastern people varying in religious beliefs and ideologies. Instead, the recent rise of different religious sects to government power has sparked fighting and violence, Pearlman said. “Sects plus power … creates inequality, abuses (and) resentment falling along identity-based lines,” Pearlman said. Timothy Garrett, project coordinator for MENA, told The Daily events like the talk at EPL are great for slowly correcting common misconceptions and myths about the “very complicated” region.